Sponsored post written by me on behalf of Smithfield® Prime Fresh Pork. The opinions and text are all mine. 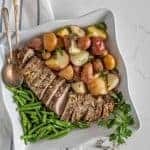 Slow Cooker Pork Tenderloin and Potatoes make the perfect simple dinner with moist and flavorful pork and potatoes that aren’t overcooked or soggy. I asked and you reported: more slow cooker recipes please! 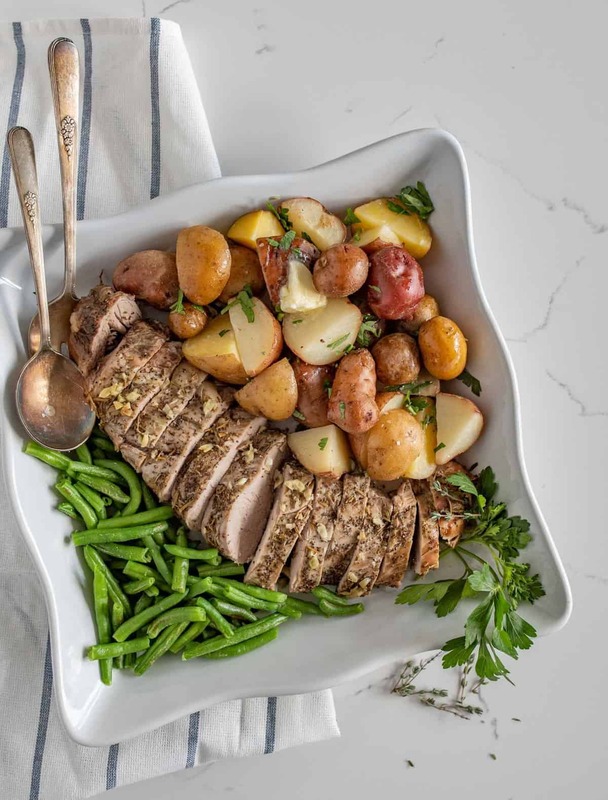 I’m so excited to share this Slow Cooker Pork Tenderloin and Potatoes recipe today because it’s a simple meal that’s sure to get rave reviews with your family. 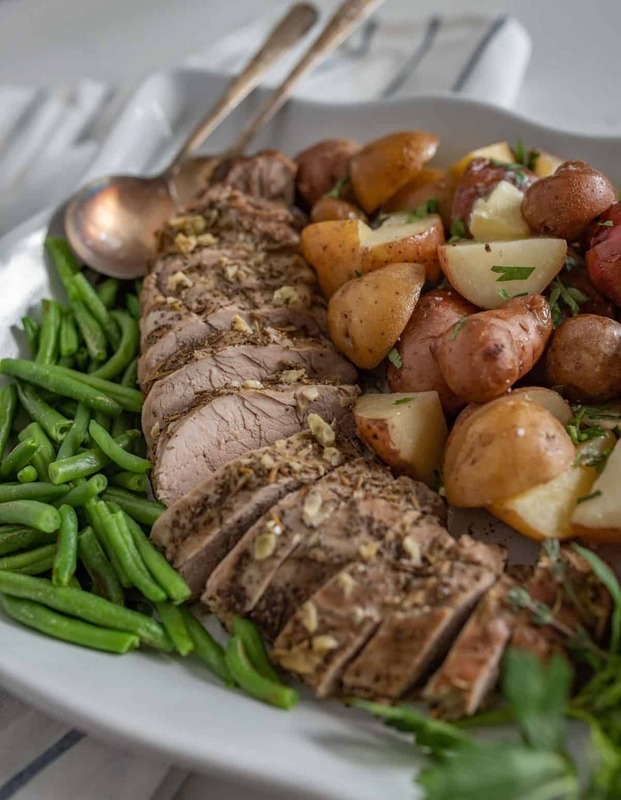 When serving pork, especially as the center of the meal, I love using Smithfield® PRIME Pork Tenderloin because not all pork is created equal! 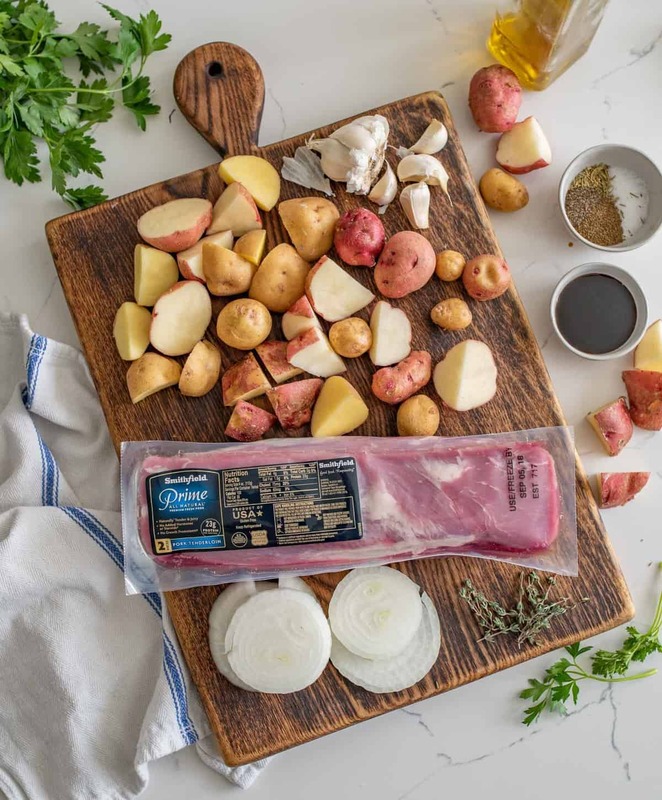 Smithfield pork is grown in the US, it contains no artificial ingredients and is minimally processed, and it’s an all around great product that is easy to find. This meal is one that you are going to make again and again. The cook time is around 4 hours, which means it’s perfect to get started right before the kids come clamoring in the door after school. It works well to make before leaving for a school or sporting event and come home to a delicious hot meal. I love to make this for family dinner on a Sunday and let it cook while I’m at church (or put it in after church and take a nap!). Let the convenience of a slow cooker and the high quality pork work in your favor. 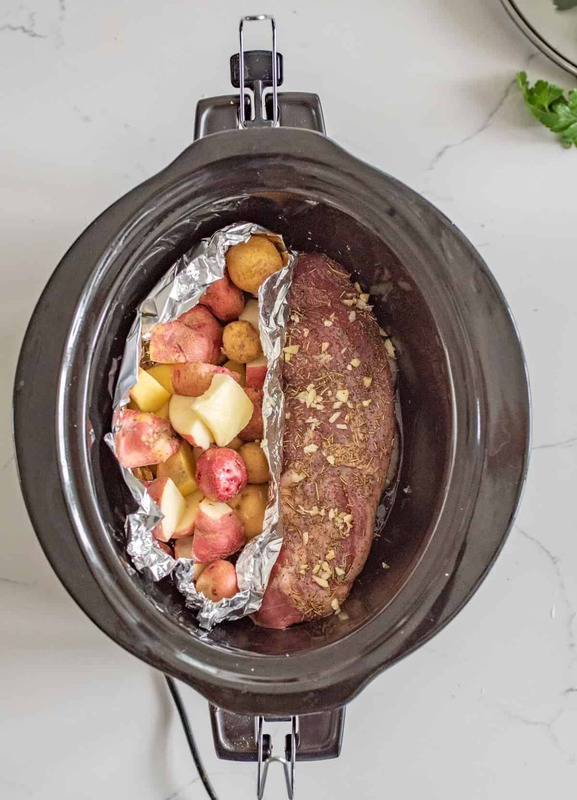 I also love Slow Cooker Pork Tenderloin and Potatoes because you cook the potatoes in a foil pouch instead of all together. The slow cooker cooks the potatoes perfectly but they don’t get soggy because they aren’t sitting in juices. You can use whatever potatoes you like and you can even use sweet potatoes or winter squash; they all work well. 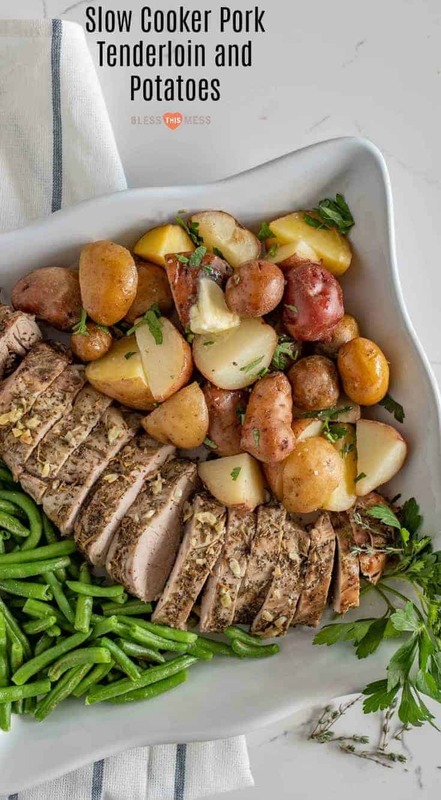 I love that you can cook your main dish pork tenderloin and the side dish at the same time. I just added some green beans and frozen peaches to the table and we had an easy and well-rounded dinner on the table in no time. Pro Tip: turn the leftover juices into gravy! Directions in the recipe notes. Mix up the fresh herbs you add to the potatoes based on what’s growing in your garden and what you like. Fresh dill and chives are also delicious. The juice that is left in the bottom of the slow cooker is delicious. Strain it and serve it “au jus” style, or add it to a sauce pan to make a gravy. Just add 3 tablespoons cold water and 1 tablespoon corn starch to a small bowl and whisk together to make a slurry. Bring the juice to a simmer and add the cornstarch slurry and stir until thickened, making a simple gravy for the pork and potatoes. An instant-read thermometer will change your meat cooking game. I highly recommend getting one. Lots of slow cookers also come with a cooking probe that will alert you when a predetermined temperature is reached. Either will work well for this recipe. For juicy, perfectly cooked pork, 145°F is the magic number. After meat gets to that temperature, and after a 3-minute rest, your fresh pork is ready and you have a juicy, tender, delicious meal. You can find Smithfield Pork Tenderlion at your local Associated Food Store. I picked mine up at Lin’s and they had quite a few other Smithfield products I want to try including gorgeous pork butts (I want a smoker, and they looked perfect for that!). Open the package of pork and remove one tenderloin. Save the second for another meal. Place the pork on a large plate. Mix together the salt, rosemary, celery seed, black pepper, and minced garlic in a small bowl. Rub the pork all over with the olive oil and then coat it well with the spice mixture on all sides. Place the sliced onion on the bottom of the slow cooker, favoring one side of the slow cooker, and then place the pork on top of the onion. Gently drizzle the soy sauce and Worcestershire sauce over the pork. Use a large piece of foil to make a pocket for the potatoes next to the pork. Be careful to make it large enough so that the pork juice won’t get into the foil. Fill the foil with the cubed potatoes and add 1 tablespoon of butter. The pork should be off to one side but not completely touching the side of the slow cooker. Add the lid and cook for 3.5 to 4 hours on LOW or until the pork registers 145 degrees using an instant-read thermometer or the probe on your slow cooker. When the pork is cooked through, remove from the oven and allow to rest for 3 minutes. 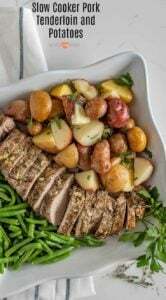 While the pork is resting, place the potatoes in a large bowl and add the remaining 2 tablespoons of butter, chopped parsley and salt to taste. Stir to combine. Slice the pork and place it on a serving platter. Serve right away with buttered potatoes on the side. The key to having the pork and potatoes finish cooking at the same time is the size of the potatoes. 1 to 1 1/2 inch cubes are ideal for perfectly cooked potatoes. The juice that is left in the bottom of the slow cooker is delicious. Strain it and serve it “au jus” style or add it to a sauce pan to make a gravy. Add 3 tablespoons cold water and 1 tablespoon corn starch to a small bowl and whisk together to make a slurry. Bring the juice to a simmer and add the cornstarch slurry and stir until thickened, making a simple gravy for the pork and potatoes. Long live the ease of a slow cooker, cooking the side and main at the same time, and delicious high quality pork that is the star of the show! You can find more pork recipes on the Smithfield website here. The pork tenderloin had two tenderloins in the package so you’ll want to pop on there and see what to use the second tenderloin for! I’m eyeing the Easy Slow Cooked Brunswick Stew on their site. Thank you so much for stopping in and enjoy this recipe from my kitchen to yours. This looks delicious! I have never thought to divide the crock pot space with foil. Wonderful! Such a great trick! I hope it’s helpful to you! This looks like the perfect dinner! Gonna have to make this for my husband! Looks like we need this for our next Sunday dinner!! Yes, it’s just perfect for that. Simple but delicious! Do you close the pocket? Help! I’m making this now. I left the pocket open but I’m sure it work work just great both ways! 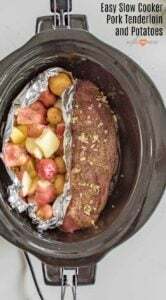 I’ve made many pork tenderloins with apples and onions in the crockpot and they were always delicious; especially having leftovers for breakfast. I just picked up a pork tenderloin and had thought about using sweet potatoes since they go soooo good with the apples. Were the size cut of your sweet potatoes the same as in this recipe? Yes, same size as the potatoes worked great! They are steamy and extra soft and we loved them. Do you sear the pork? When it’s resting, do you put it in foil? Also, does it rest on counter or in oven? I didn’t sear the meat but you sure could. I just let it rest in the slow cooker, while the slow cooker was off and the lid was off. And I let it rest on the counter before serving. Hope that helps! Potatoes were not done. I even cut them smaller that directed. Would of turned out better if I omitted the foil and just put taters in juices. How long would cook time be with the two that come in a package and no potatoes? Thinking of making this today. It’ll be about the same, I’d plan on 4 hours on high for a pork roast you want to slice, even if there are two in there. Do 6 hours and a cup of water on the bottom if you want to shred it. Yep, that will work great! You might plan on an extra hour of cook time since your slow cooker will be nice and full! So easy and so good! I put this all together in like 10 minutes. I did use as many potatoes and onions that I could fit in with my two small pork loins. Came out perfect after just 4 hours on low. Gravy was delicious! Isn’t it awesome! I’m so glad that you liked it as much as we do!